Every 5 to 10 years I decide that it’s a good idea to head up Shepherd Pass again. 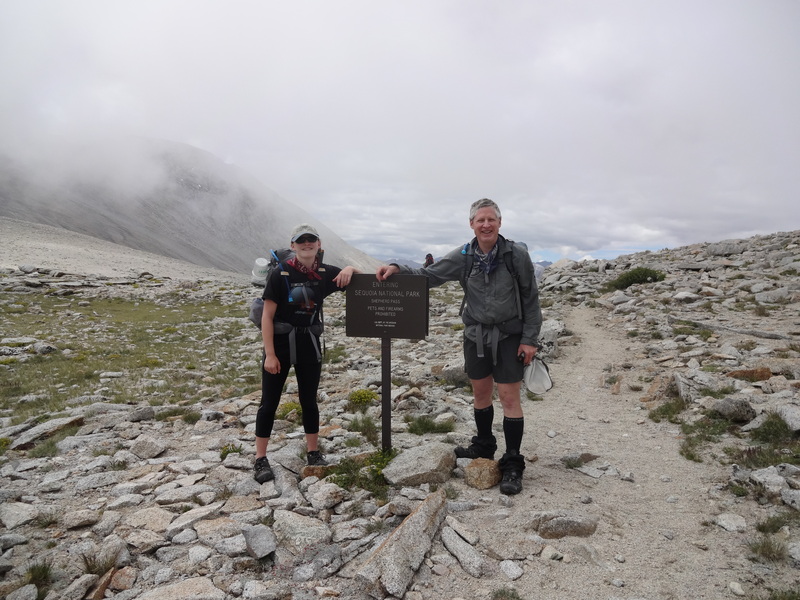 The first trip was back in 1978, when the Sierra South trail book’s description of it as “one of the most challenging passes in the Sierras” caught my eye. Back in those days there wasn’t much of a trail near the top, so three of us kicked steps in the snow-covered headwall. The second time involved a dead horse in the Potholes area (1990), followed by an insane decision to cross the talus-cursed field that is the Williamson Bowl (2000). 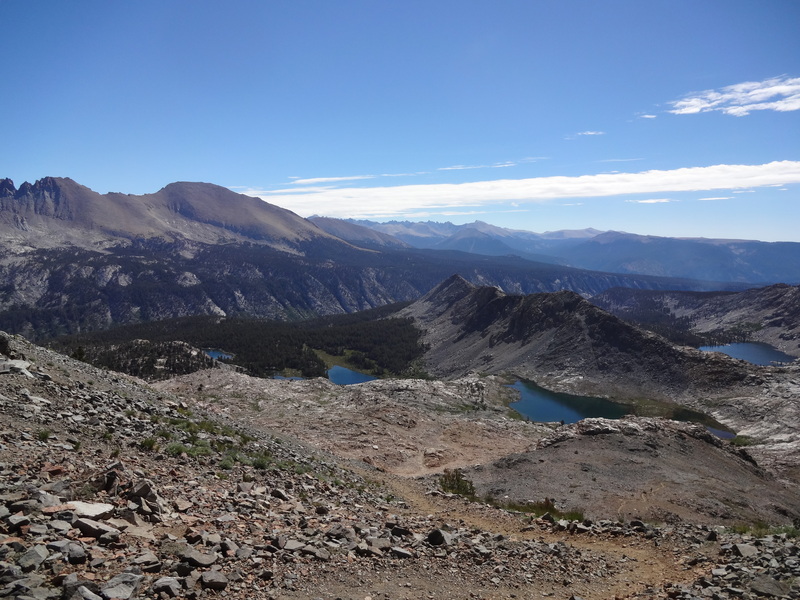 My last trip over the pass was an out-and-back to East Lake in 2009, so six years later I’d forgotten enough about it to accede to my daughter’s request for a hike that included the pass. 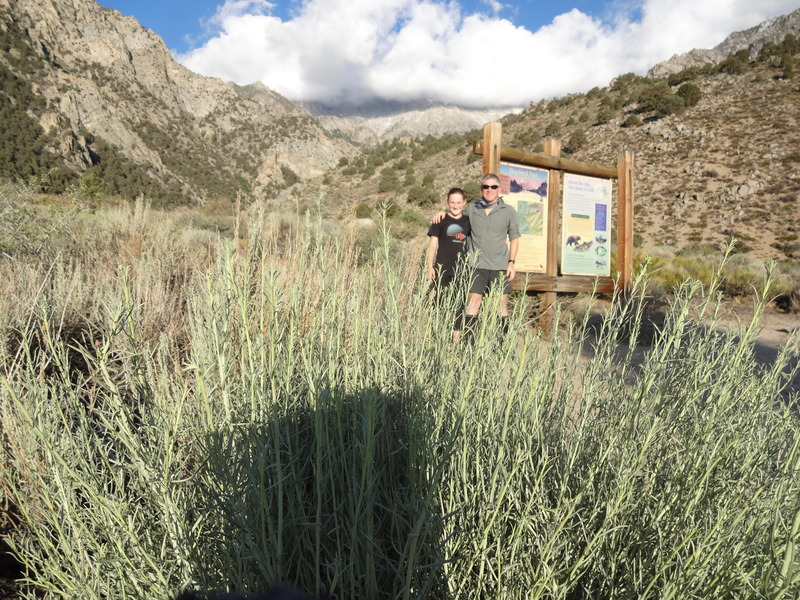 To make things more interesting, we decided to do it as a trans-Sierra trip, crossing through remote Kaweah Basin and meeting up with friends in the Big Arroyo, before exiting via Mineral King. Since it’s a one-way, issue #1 was how to get there. I originally made plans to use the Eastern Sierra Transit bus from Reno to Independence (or “Indy”, as the locals say). 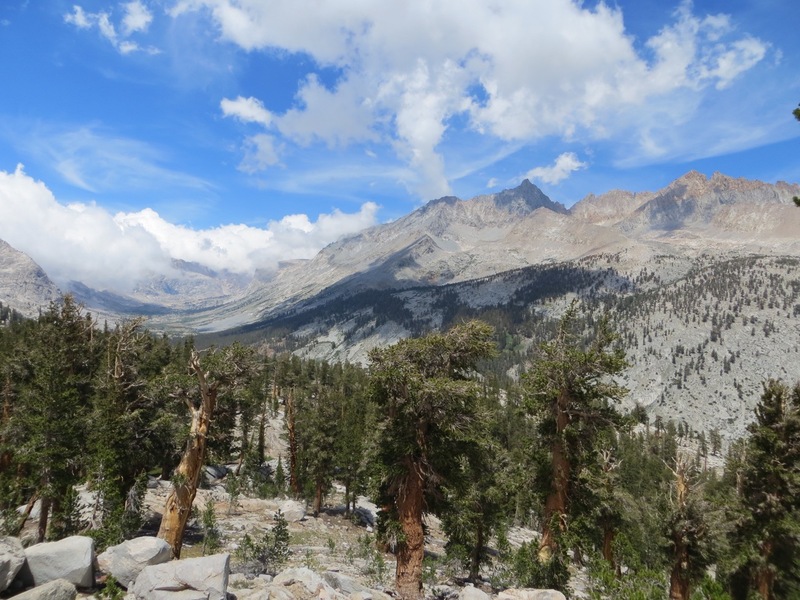 But since we’d be spending time in Sequoia-Kings Canyon Nat’l Parks (SEKI), we had to get our permits in person at one of the four offices along the eastern Sierras. Which doesn’t work very well for the once-a-day bus to Indy. Wouldn’t it be great to have a “Trusted Hiker” program similar to TSA Pre-Check, where you could then get your permit mailed to you directly? 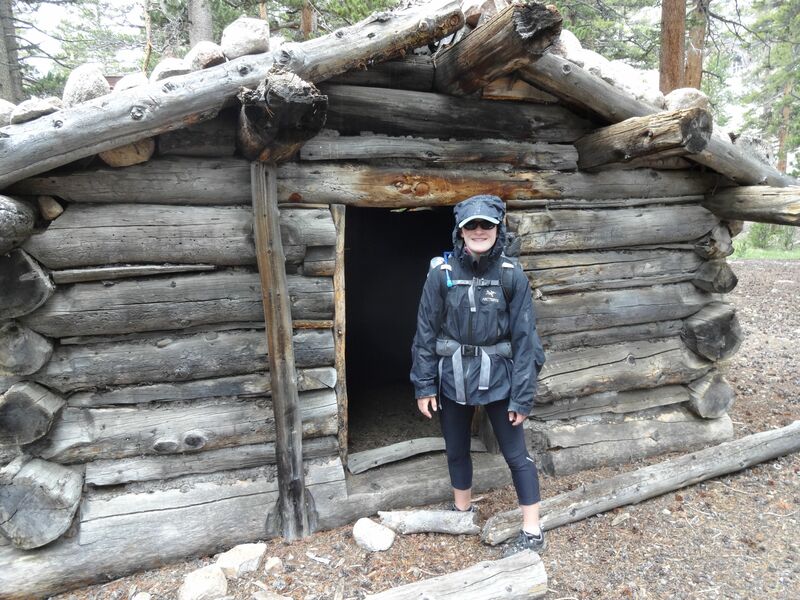 My convoluted solution was to rent a car from Hertz in Grass Valley, drive with Jenna to the Mono Basin visitor center & get the permit, then continue to Mammoth Lakes. There we dropped off the car, and caught the south-bound Eastern Sierra Transit bus at 5:20pm, arriving in Indy at 7:30pm. We spent the night at the Mount Williamson Motel, which is a great place for hikers. Our host that night was Dave (Cris, aka “Strider”, was out and about), who made us breakfast in advance so we could heat it up early the next morning before our shuttle ride to the trailhead. Thanks Dave! And as it turned out, not leaving a day earlier was a good call…there had been torrential rains, hail, sleet, and flash floods today in the mountains. But it was rapidly clearing for our start the following day. Speaking of the shuttle, we used Paul Fretheim of East Side Sierra Shuttle to get to the Shepherd Pass trailhead. He showed up promptly at 6am as promised, and was a wealth of information about the area. The above photo is from the hiker’s trailhead, which is a bit upstream from the packer’s trailhead (note that you can click on any photo to see a larger version). We actually got started at 6:45am, with the traditional four crossings of Symmes Creek, followed by a 2300ft climb up to 9100ft atop a ridge that separates the Symmes Creek and Shepherd Creek drainages. From there (4 miles out) came the soul-sucking 500ft descent to where you cross a (typically) year-around stream, followed by the ascent to Anvil Camp (8.7 miles). But before you can relax in the trees, you have to cross the dreaded “washout of 2013”, as several people had warned. Which wound up being much ado about very little. You walk down one side of the gully, head about 40 feet to your left (downhill), and then scramble up the other side. It’s another 2 miles through the Potholes and up the headwall until you reach Shepherds Pass at 10.7 miles and 12,050ft. Which is about 2.7 miles more than Secor has in his “The High Sierra” book. Thanks for low-balling it, RJ. As you can see, afternoon weather was blowing in. 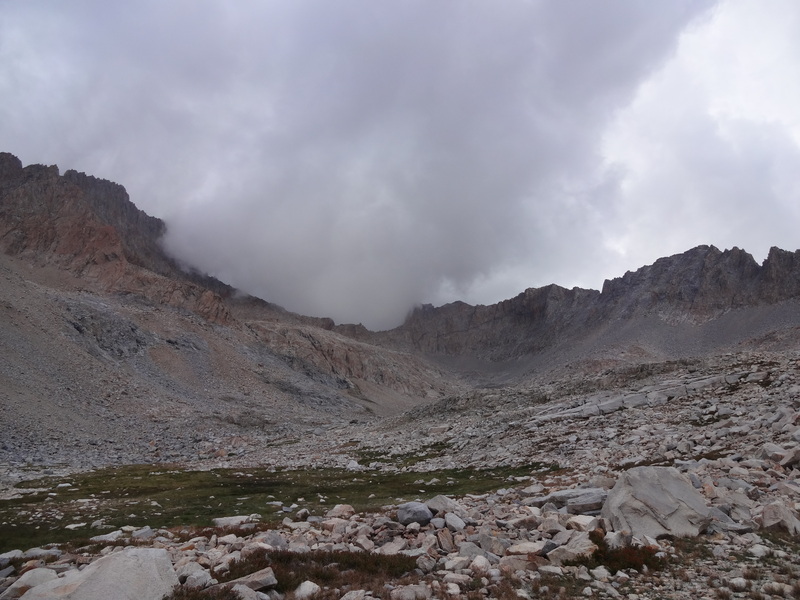 We then had the long, gradual 3.4 mile descent to our junction with the JMT/PCT. Turning left (south), we hit the junction with our side trail to the Tyndall Creek ranger station in a few hundred yards; note that current topo maps incorrectly show the junction being to the north. This side trail used to be called the Tyndall Creek trail, or the “John Dean cutoff”, depending on what you were reading. 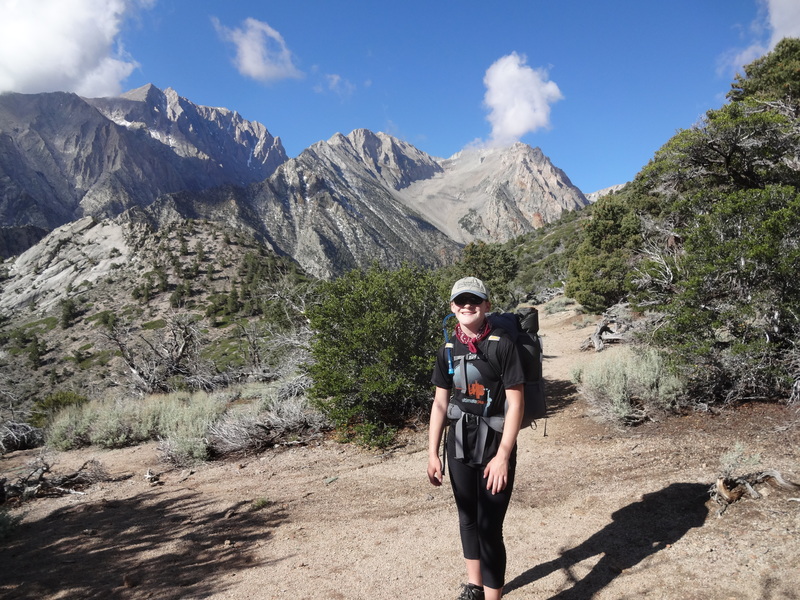 It’s actually an unmaintained stock trail that connects with the Kern River canyon, of which the last 0.6 miles to the JMT/PCT is now a real trail that leads to the ranger station. Turning left (south) once again, we continued descending all the way to 8000ft at Junction Meadow. 24 years ago my wife & I had entertained ourselves here by pulling the proboscises off mosquitoes that blanketed the netting on our tent. 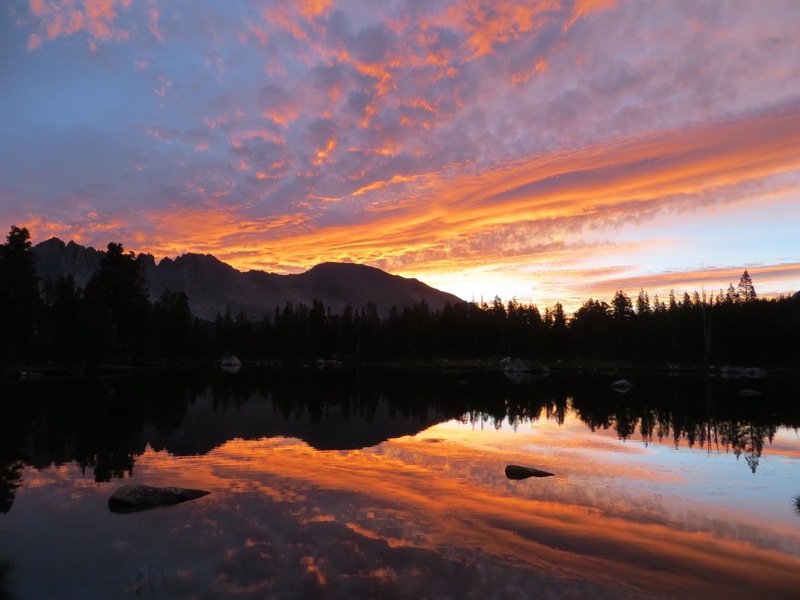 We’d heard from several people that the bugs were bad this year, so I wasn’t very excited about camping in that same area, but it seems like the southern Sierras were relatively free of the curse that was making northerners so unhappy. 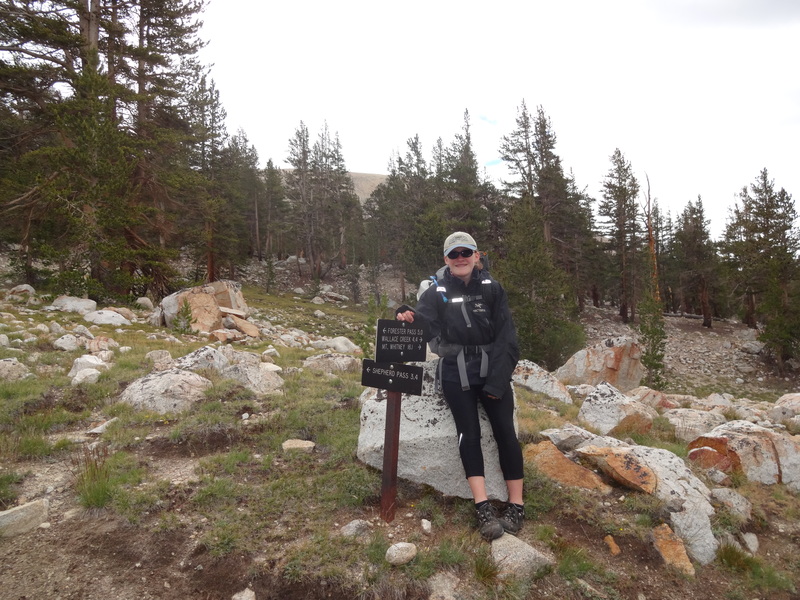 Jenna was excited to stop after 21+ miles and 8200 ft of gain. We got a slightly later start, so our tent and gear had a chance to dry some before we packed up. The first bit of the Colby Pass Trail involved finding our way across several branches of the Kern River, which took longer than expected. 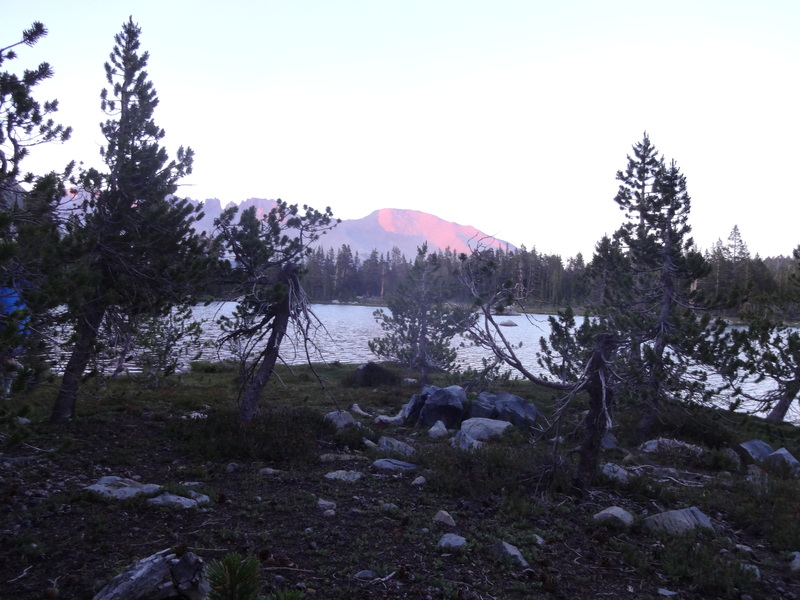 After that we had a 3 mi ascent on an often overgrown trail to Rockslide lake – glad we didn’t try to push on to this spot the previous night, as there aren’t any campsites in the area. At 3.75 miles we encountered the trail maintenance camp that Ranger Chris had mentioned as a good starting point for the cross-country leg of our trip. 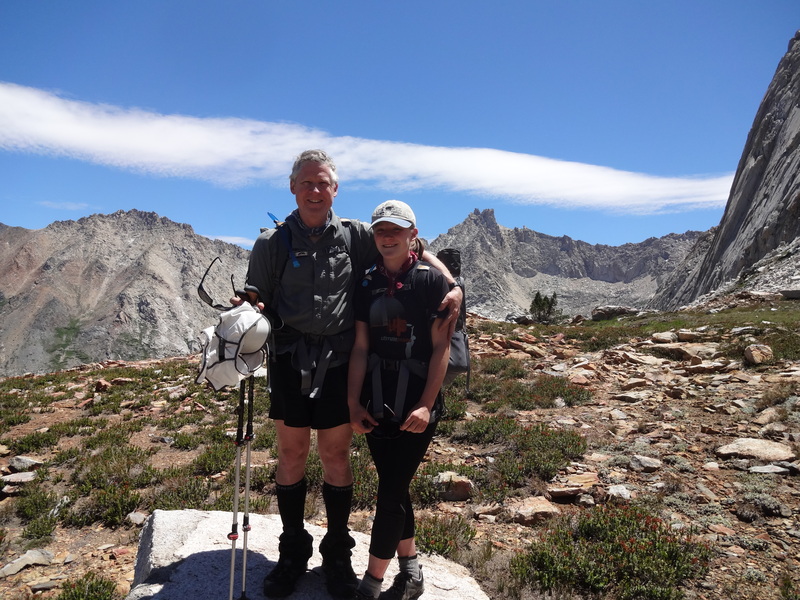 We quickly found a way over Kaweah River, then slowly worked our way south up the shoulder of the ridge that separates Kaweah River from Picket Creek. After a few false ridges we finally arrived above “Picket Guard Lake”, which is a beautiful gem that I’d love to camp at one day. 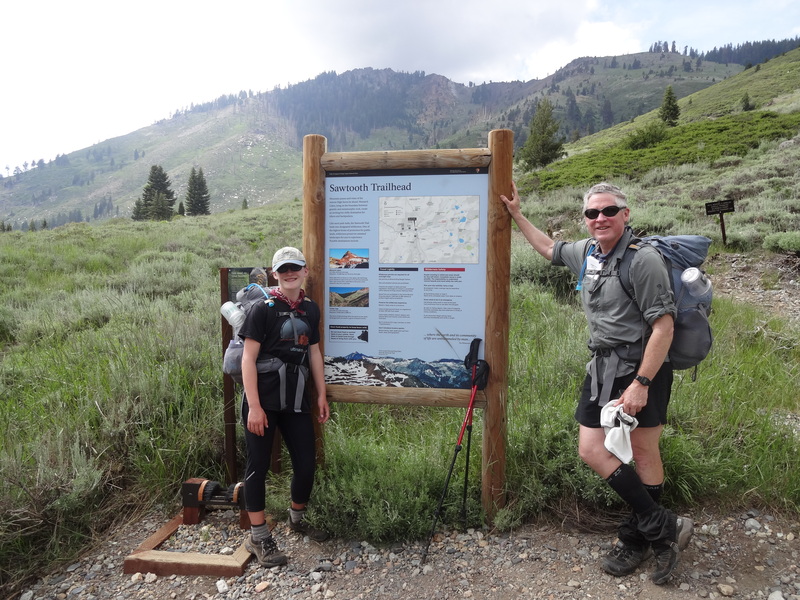 We then crossed Picket Creek and headed west up the canyon for about a 1/2 mile before angling south over the low point in the ridge that divided us from Kaweah Basin. 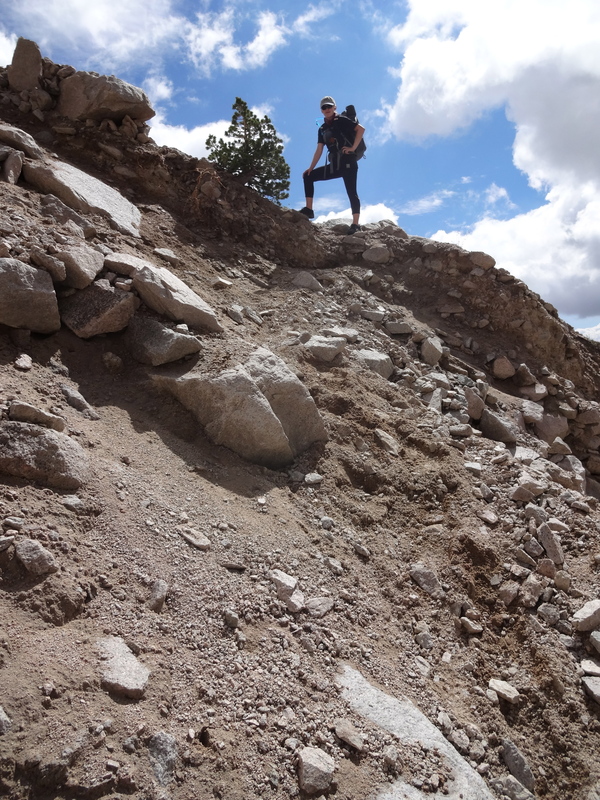 Upon descending, we encountered unpleasant talus alongside the creek that heads up into the basin; in hindsight we should have crossed, found a way up out of the small gorge it flowed down, and continue on the (much easier) slopes on the other side. Instead we wove our way upstream along the creek until the talus-choked gorge ended, after which we continued in a generally west direction towards Table Mountain. We kept a close eye on weather that continued to threaten us from the west, but in the end we remained dry. 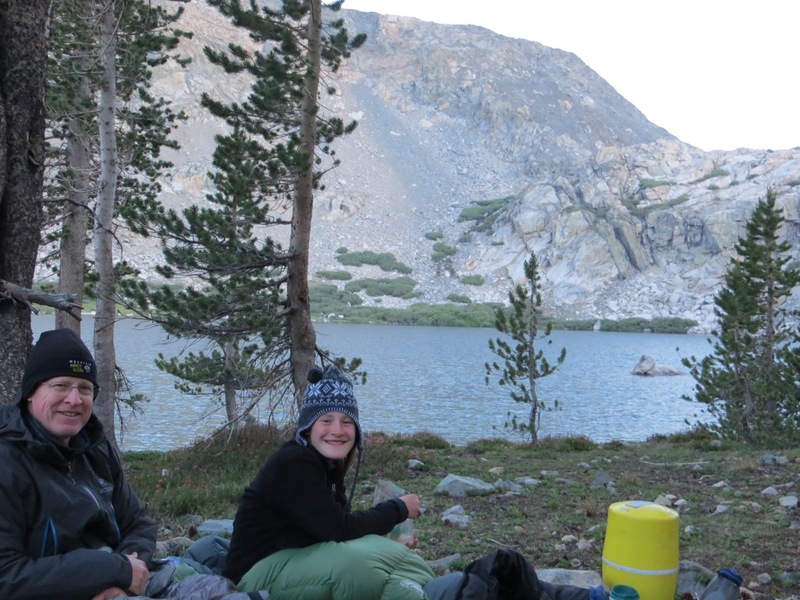 We made camp by the three large lakes at the head of Kaweah Basin at about 3pm, after 8 miles and 3800 ft of gain. Unfortunately atmospheric conditions then played a cruel trick on us. I’d been attempting to contact my friend Randy via walkie-talkie on the hour, as we’d agreed upon in advance. 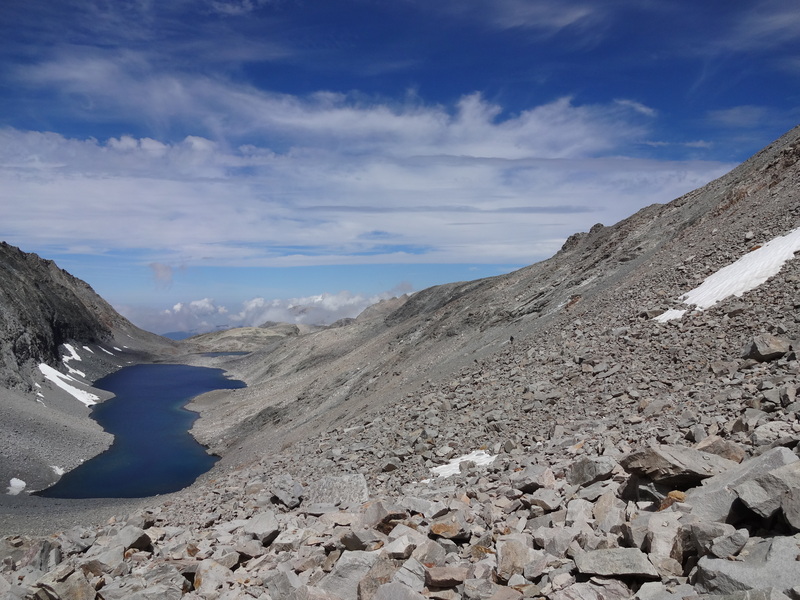 He was planning to hike in from Mineral King (in the west) over the previous two days, then come from the Big Arroyo over Pyra-Queen Col and meet us this evening, and at 4pm I heard him say “I’m stopping at the <garbled> lake.” Since Pyra-Queen Col (at 12,800ft) is the low point on the ridge between us and the Big Arroyo, I assumed he must be at the col or in the Kaweah Basin, as you need to have good line-of-sight for the radios to work. So I spent the next several hours climbing up various high points in the basin, trying to re-establish contact…to no avail. We checked all of the lakes again, just to make sure he wasn’t camped over a small rise (that would have been embarrassing). Still nothing. In the end we decided he’d gotten to the top of the col and then turned around, even though that really didn’t make any sense. We knew this would be a challenging day, so we got started by 7:30am. 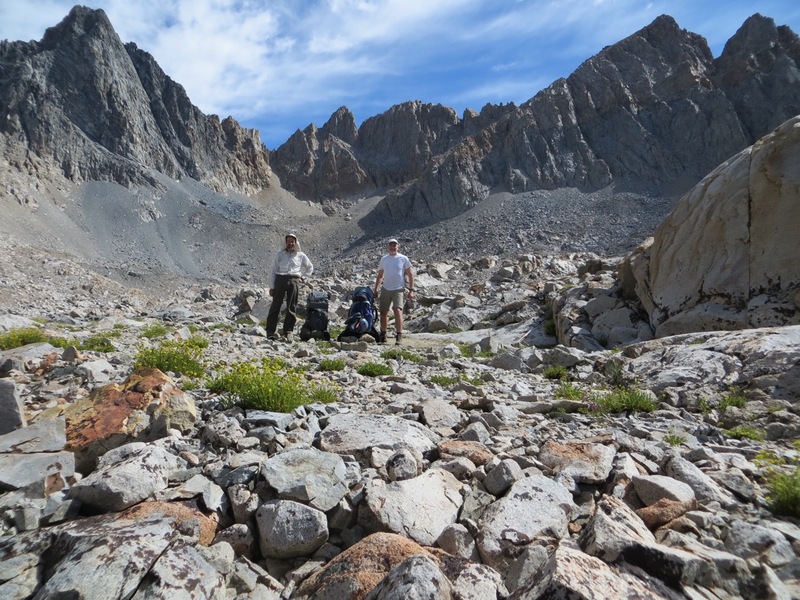 Looking north, the red “bump” on the ridge was obvious – thanks to others for having posted such great route descriptions, especially Mark Scheeff’s Kaweah basin trip report from 2005. The one significant navigation error I made during the trip was near the top of the valley leading towards the col in the photo above…I took us too far to the right, so we had to do a somewhat painful traverse over talus to get to the smaller ramp that runs left-right up to the actual col.
Once we reached the top of the col, the negative impact of bad weather during previous days became clear – we had icy packed snow in the chute down from the col, which prevented us from following the right wall. 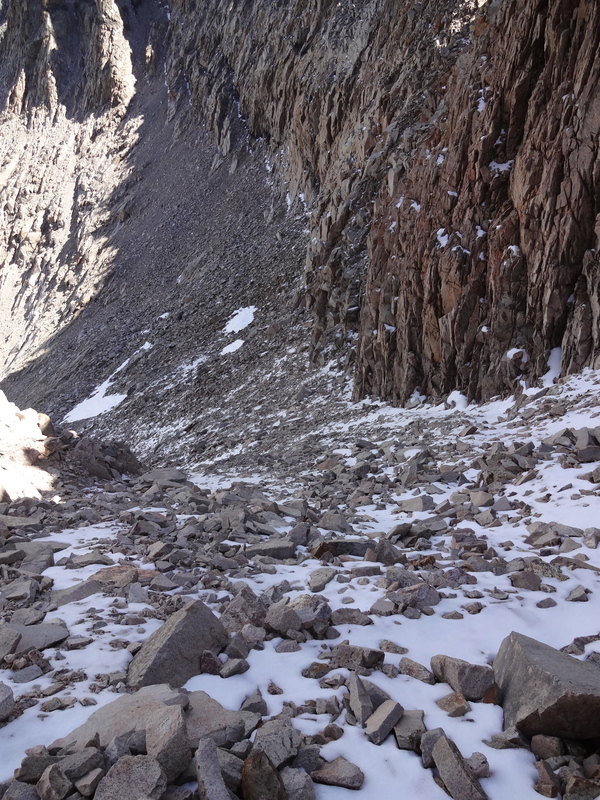 Instead I had to carefully talk my daughter through several crossings of a steep snow chute that ran down the middle of the descent path, once we got past this first stretch (that was the “easy part”). I think Jenna nailed it when she said “I never thought I’d be so happy to get onto talus”, once we were out of the chute. And then we suddenly heard from Randy on the walkie-talkie; he had spent the night at Lake 11682, and was working his way up the slope to greet us. He’s the very small black dot in the picture below, about even with the bottom of the right snow field and just right of the center of the picture. With Randy guiding us down the easiest path, we were soon at the lake and getting ready to enjoy lunch. 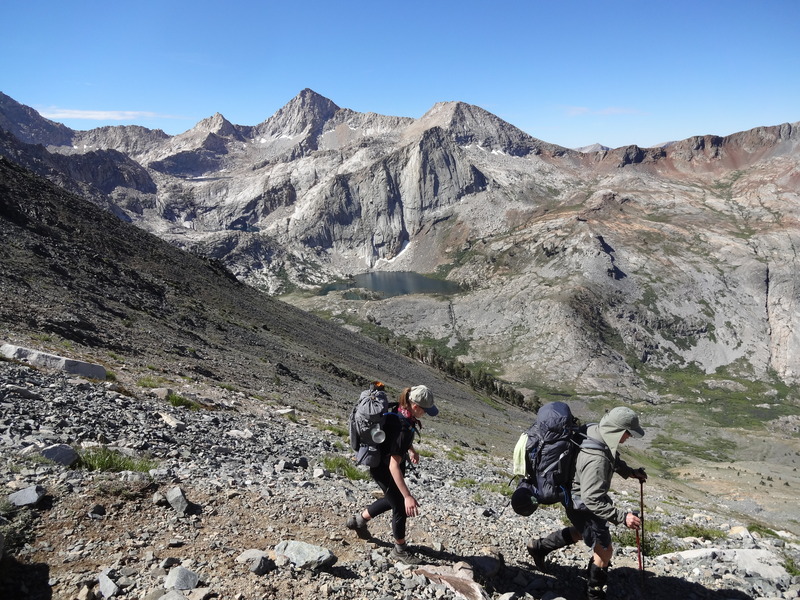 From here we descended into the Nine Lakes Basin, then headed towards Kaweah Gap, where we picked up the High Sierra Trail and headed left (east) towards the junction with the Big Arroyo trail. 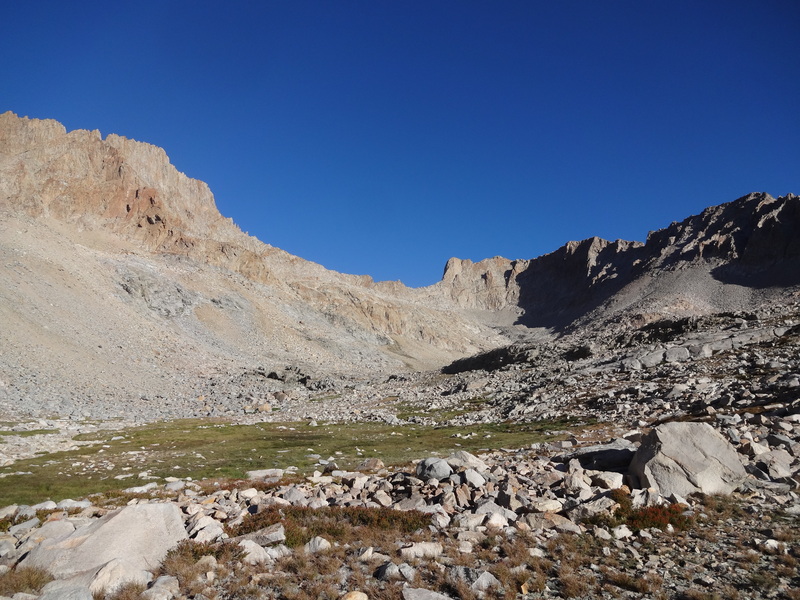 While cruising down this trail, we got a walkie-talkie call from Chris “Schmed” Schneider, who was on the Black Rock Pass trail near Little Five Lakes, looking towards us as we descended from Nine Lakes basin. 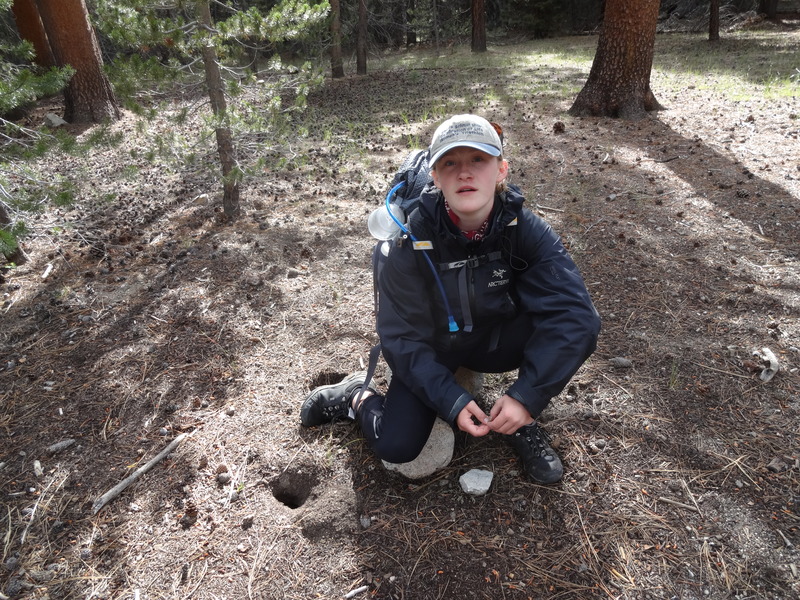 And that was really good news, as our original plan was to meet him and Mike “Foo’ball” Bromberg at their camp near a high lake just below Red Kaweah. Which would mean we’d have a steep uphill XC slog to get there, and a really long day tomorrow exiting via Mineral King. 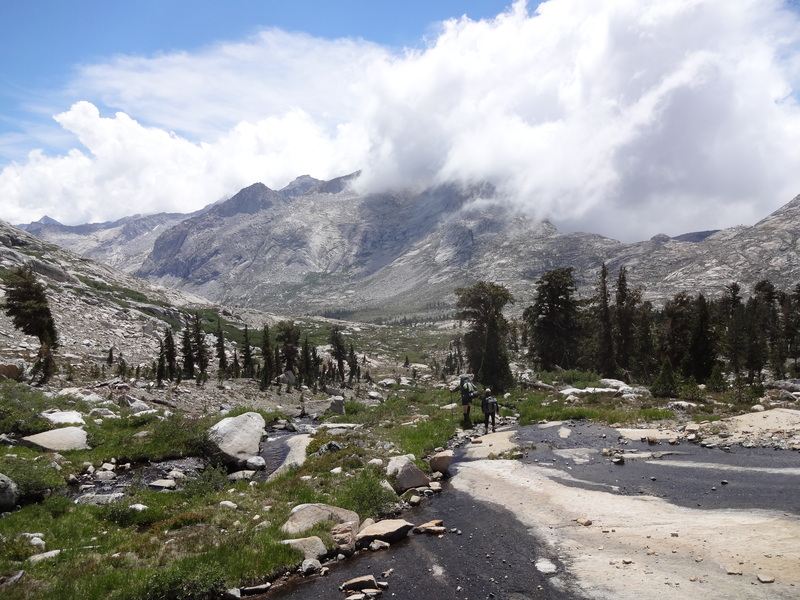 Instead we headed toward Schmed & Foo’ball on the Black Rock Pass trail, passing one of several beautiful lakes before arriving at their campsite on the shore of the middle lake. It was great to be able to relax with all of our friends, while watching the sun set on Mt. Kaweah. After which we headed up Black Rock Pass trail at 8:45am. 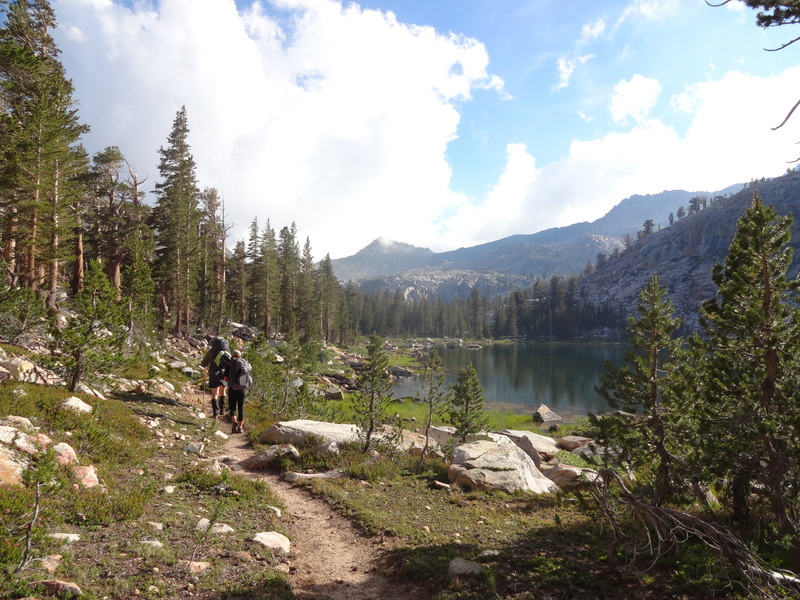 Along the way we had some excellent views of the Little Five Lakes basin. As well as a nice panoramic of the Kaweahs and the lakes. Below Glacier Pass is a lovely bowl, with a good use trail all the way to the pass. Here’s a shot looking back towards Black Rock Pass from near that bowl. Glacier Pass itself was anticlimactic; in low snow years, there’s no cornice, so you can follow what looks like an old trail (we saw a few iron bars hammered in to hold rocks) all the way to the top, with no class 3 to be seen. 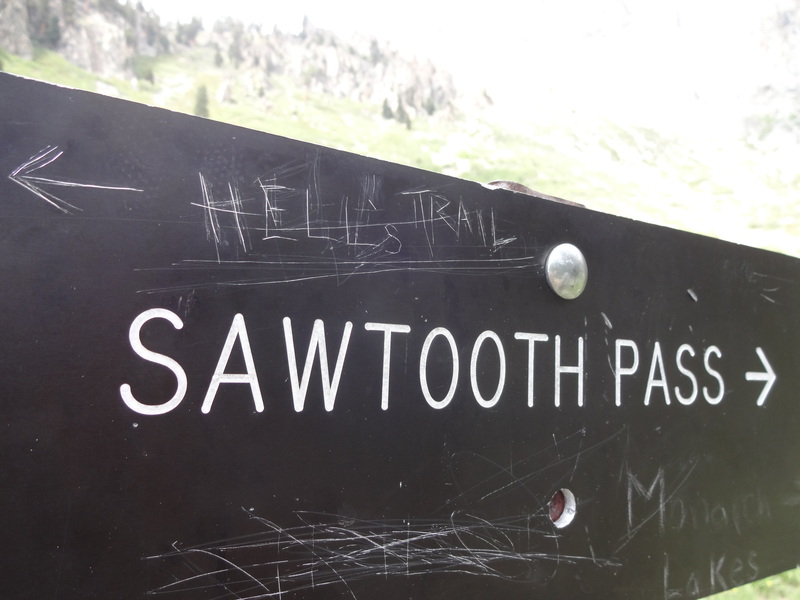 The other side was actually harder, in that the use trail turns into a dozen branches across a sandy slope leading towards a small ridge, after which the Sawtooth Pass trail is pretty much a bunch of use trails following all possible paths up the slope. 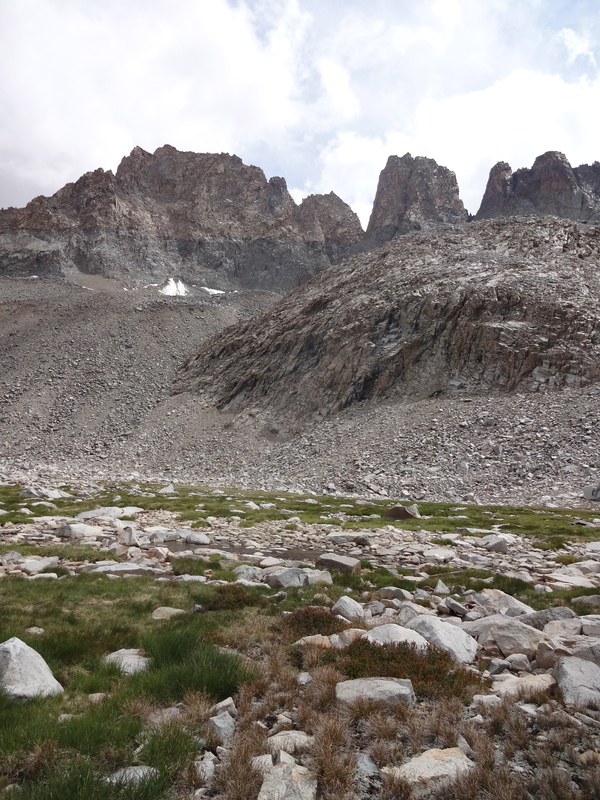 My only advice here is to try to get the left of the slope as you head down, so that you can eventually do some scree skiing down to lower Monarch Lake. I’m guessing they were referring to all of the Star Thistle that you had to avoid on your way down to the parking lot. From here we caught a ride with Randy to Bakersfield, with a stop for Mexican food, followed by a welcome shower at the Marriott. 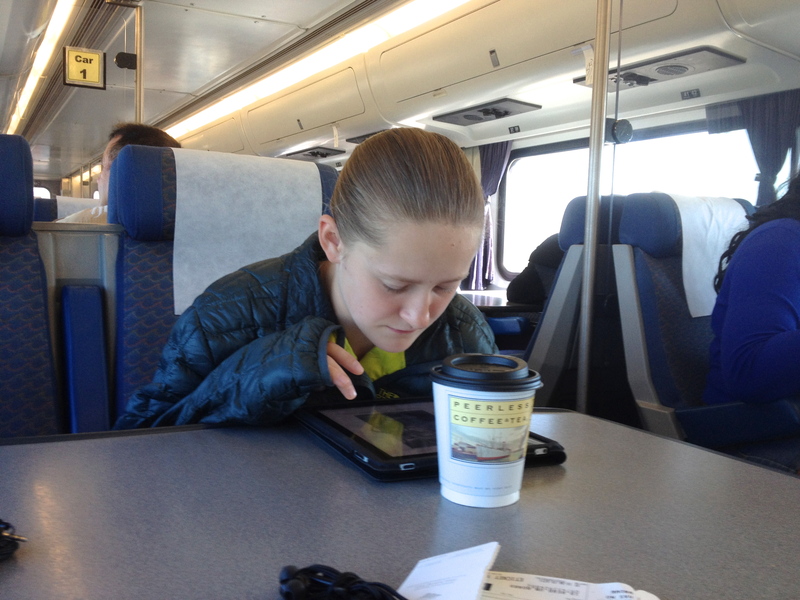 We caught the 7:15am San Joaquin train, arriving in Sacramento a bit before 1pm (25 minutes late). My brother-in-law picked us up curbside, and gave us a ride back to Nevada City. Thanks Paul! It was a bit of a miracle that it all worked out, given the weather and complicated meetings in the backcountry. 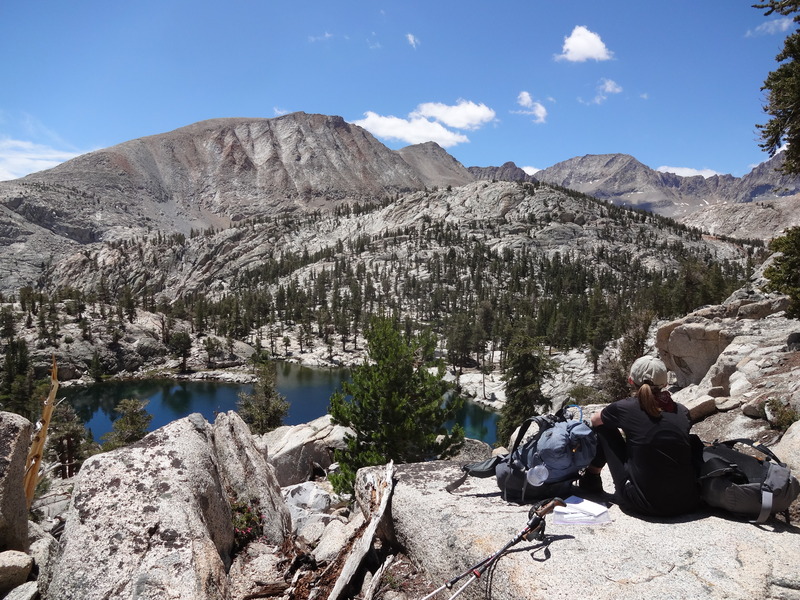 Ultimately it was a wonderful experience with my daughter and friends, and I finally got to experience the splendid isolation of the Kaweah Basin. PS – in case you’re interested, I uploaded my GPS data to Strava, though sadly my Garmin 401 GPS missed the first 5.6 miles and +2800/-500 of elevation. But it gives you a pretty good idea of the route, and elevation profile. PPS – once the Vulgarian Ramblers site is fixed up to handle long paths, I’ll post a link to the complete route, along with an elevation profile. You are currently browsing the Ken's Techno Tidbits blog archives for July, 2015.